The next Ultimate Florida Challenge is Saturday, March 07, 2020. There is an equipment inspection Friday, March 06, 2020. Cost is $1,500.00 for the captain and $750.00 for a crew member if any. Billing starts January 1 at noon. Finishing an Ultimate Florida Challenge will qualify you for a 25% discount on all future WaterTribe events. Cummulative discounts are limited to 50%. The normal entrance requirements apply to this event. You no longer will be required to complete a previous WaterTribe event to enter this event. After due consideration it has been decided that the Everglades Challenge for the first stage of this event is a built in qualifier. That being said, think long and hard about entering the Ultimate Florida Challenge. It is a long, grueling event that will chew you up and spit you out. Due to the exteme commitment for this challenge late registration and/or late payments will not be allowed. We recommend that you commit to this race early so you have plenty of time for planning, training, and preparation. Pay early in the payment cycle. You can get a full refund up until January 31 at noon. No refunds after that date and time. This is the toughest small boat challenge you will find anywhere. If you want to test yourself against everything Mother Nature has to throw at you and see what you are really made of you have found the way. This race circumnavigates Florida in five stages. The checkpoints are shown above. The first stage starts at Fort Desoto in Tampa Bay, Florida along with the Annual Everglades Challenge. At Key Largo you turn north and head for the Sebastian Inlet Stage Point. From there you make your way to the Stage Point at the boat ramp near Fort Clinch. Then it's about 90 miles upstream on the St. Marys River passing the virtual CP at Traders Hill and on to the virtual CP at St. George. Here you will begin the infamous 40-mile portage to the Suwannee River at the Fargo virtual CP. After about 220 miles down river you are back in the Gulf of Mexico - next stop the Cedar Key Stage Point. The final sprint from Cedar Key finishes back at Fort Desoto. It's hard to predict which stage will be the toughest since weather will be a factor, but watch out for the 40-mile portage between the St. Marys River and the Suwannee River - it's a heart breaker - or maybe a feet shredder. Each major Stage Point (Key Largo, Sebastian Inlet, Fort Clinch, and Cedar Key) is treated like the end point of a WaterTribe Challenge. That means you can have whatever support you want at these points. Virtual checkpoints like Traders Hill, St. George, Fargo, after Big Shoals, and Suwannee River State Park are treated like Everglades Challenge CPs and Rule 4 covers these locations. Note that race officials may or may not be present at these Stage Points and virtual checkpoints. It depends on many factors including how many challengers are in the event, how spread out those challengers are, and how many race officials are available. What is a virtual checkpoint? You are required to send an OK or Custom Message at virtual checkpoints. Although the deadlines allow just a bit more than 29 days to complete the Ultimate Florida Challenge, hard chargers might be able to do this in 15 days or so, but the weather would have to cooperate. A more reasonable target is 20 days give a take a couple of days. Cruisers may take a more leisurely pace and use every minute of the allowed time. Of course, this challenge is so tough that it is possible that nobody can complete it in the allowed time limits - we'll see. Finishing Stage 1 (EC) earns a shark tooth and an alligator tooth if you take the full Everglades WW. Finishing Stage 2 earns a shark tooth. Finishing stage 3 earns a shark tooth. Finishing stage 4 earns an alligator tooth. Finishing stage 5 earns a whale tail. You must do the whole Ultimage Florida Challenge. Individual stages cannot be entered seperately except for the Everglades Challenge. Note that missing deadlines (grace periods), clearance to leave, and other rules are covered in detail in other pages of this web site. Important Note: SPOT with tracking feature is required and correct usage guidelines must be followed. Note that the WaterTribe Ultimate Florida Challenge runs concurrently with the Everglades Challenge. You should examine the Everglades Challenge information carefully. Race - Saturday, March 07, 2020 to Sunday, April 05, 2020. The following table shows the schedule for the first stage. This includes inspections, captains meeting, the start and checkpoints that are in common with the Everglades Challenge. 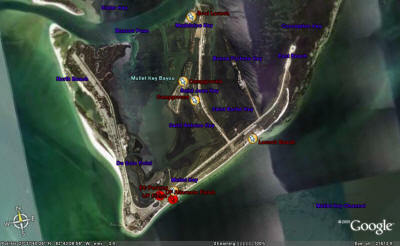 Placida, FL Sunday Noon As of EC2008 Challengers must get to CP1 by noon Sunday. The next table shows the schedule for each stage. Note that the deadlines shown here apply to the Ultimate Challenge. The regular Everglades Challenge participants will have until Sunday at noon to finish. This is where it all starts. If you click on the picture below you will see markers for the launch beach, the campground, long term parking for EC participants, and the boat launch for some class 4 boats. Shelter 13 is the closest shelter to the launch beach. Note that the finish beach location is slightly different because we need 24-hour access for the finish. This graphic is changing soon to show the new finish location. There is an equipment inspection for EC and UF participants at or near shelter 13 on Friday starting at roughly 09:00 and finishing roughly at 17:00. Please get to the inspection area with your boat and all equipment as early as possible so there is plenty of time to get it all done. Large boats can launch at the regular boat ramp and then sail around to the launch area. Smaller boats can unload in the parking lot and then ferry boats and equipment to the beach. Road access to the beach is not possible as of EC2011. You must leave your inspected boat on the launch beach overnight. We have two "guards" who will camp out near the boats. IF YOU ARE NOT A GUARD, YOU MAY NOT CAMP ON THE BEACH. ANYONE CAUGHT CAMPING ON OR NEAR THE BEACH WHO IS NOT AN AUTHORIZED GUARD WILL BE DISQUALIFIED AND ESCORTED OUT OF THE PARK. The "guards" will keep an eye out for major problems, but racoons can still get in your stuff. It is recommended that your hatches and cockpit be secure and that you only load provisions and water in the morning before the launch. This is Stage 1 for the Ultimate Florida Challenge and Stage 3 for the Florida Coastal Challenge. It is almost identical to the Everglades Challenge. The only difference is that the deadline for Key Largo is about one day sooner than the Everglades Challenge deadline. Yes, you do have to go into all EC checkpoints and hit your OK or Custom button. There will be logbooks to sign in too. Rather than repeat all the EC info here, just go to the Everglades Challenge section, but note the different deadline for Key Largo. Hopefully you saved some energy during the Everglades Challenge section because now it is time to turn north and make your way from Key Largo to Sebastian Inlet State Park. Although there are some "wild" areas in this stage, it is also one of the most populated areas in Florida with more than its share of boat traffic. Be careful and stay alert. This stage is roughly 180 nautical miles. Since you have proven yourself by finishing the Everglades Challenge and we want to keep the Ultimate Florida Challenge a true expedition-style adventure, there are no checkpoints between Key Largo and Sebastian Inlet. This lack of checkpoints means that correct usage of your SPOT is even more important. Fortunately, cell phone coverage is good over most of this stage. A race official may or may not meet you at the Stage Point and provide help with resupply if you need it. A race official may or may not supply a ride to local stores for resupply, maintenance of equipment, laundry, etc. Please note that it could take a few hours for someone to meet with you since we may be spread out over distances of a couple of hundred miles. A camp site may or may not be available, but there are plenty of places for a stealth camp. Ready for some more? Just keep heading north and after about 170 nautical miles you'll run into Fort Clinch just before you cross into Georgia. You will paddle thru heavily populated areas and some really nice areas. 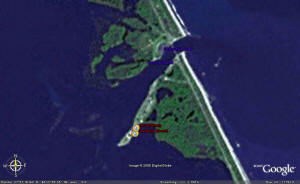 Again during this stage there are no checkpoints between Sebastian Inlet and Fort Clinch. You are on your own but you must keep reporting your progress at least once in each 24 hour period and your SPOT must stay on. The location of the landing for this SP is just on the north side of the public boat landing. A camp site in the park may or may not be available for your use. Fort Clinch is not kayak friendly at this time so we will figure something out. There is good bivvy camping next to the sandy beach landing spot on the north side. Be careful not to cross into the park if bivvy camping. A race official may or may not provide a ride to local stores for re supply, maintenance of equipment, laundry, etc. Please note that it could take a few hours for someone to meet with you since we may be spread out over distances of a couple of hundred miles. It could take several hours for a race official to meet with you at or near Fort Clinch because challengers may be spread out by several hundred miles. Use your SPOT to check in via an OK Message. If you need a ride or help for resupply, call the race manager or CP Captain or the Roving Captain. This just might be the toughest stage of the whole challenge. Certainly it is the longest consisting of 90 miles upstream on the St. Marys River, a 40-mile portage from St. George to Fargo, 220 miles downstream on the Suwannee River, and a final 20 miles to Cedar Key for a grand total of over 370 miles. Several miles on the rivers can be extremely difficult depending on water levels any given year. If the water is too low, you end up pushing and pulling your boat for mile after mile. If the water is too high, first you are fighting a strong current on the St. Marys. Then you are dealing with white water at Big Shoals and other spots in a loaded boat designed for straight line cruising. But there is some good news. The upper St. Marys and Suwannee Rivers have some of the most interesting and beautiful campsites you will find anywhere. Did I mention alligators? Cottonmouths? Rattlers? Pray for cold weather so these critters are slower than normal. So are you ready for some fun! These checkpoints will NOT have a lock box at the location due to theft during previous challenges. Instead, your SPOT OK Message sent from these locations will confirm arrival. In many cases race officials will be at these checkpoints when you get there, but that is not always going to be true. 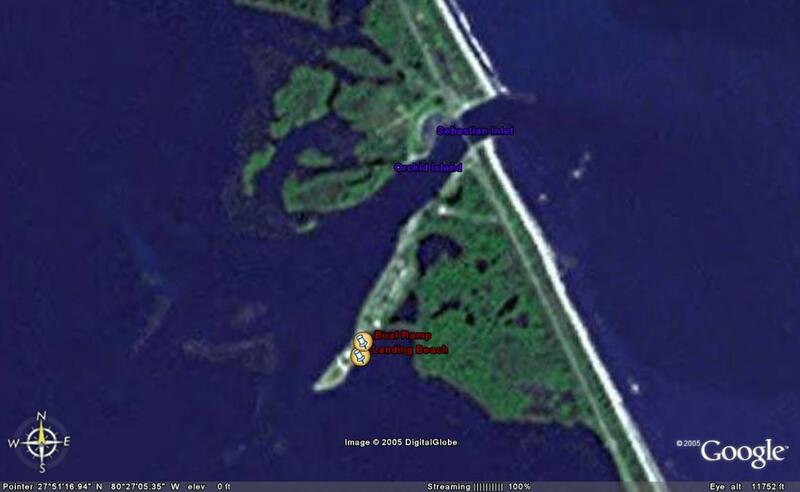 Fort Clinch State Park is located at the very NE tip of Florida near Fernandina Beach which is north of Jacksonville. New Option: Any Class may switch to any other Class at Fort Clinch. You can also switch at the town of St. Marys but you must inform a race official of your plans. You must have your shore crew meet you at Fort Clinch or St. Marys to make the switch. They will meet you again at Cedar Key or the town of Suwannee to switch back to your original boat. You must carry all gear that you need for stage 4 for the entire challenge. The only thing that can be switched is the boat and paddles. Everything needed for the stage 4 boat must be carried the entire race. All of this will be checked at inspection. Boat switchers are not allowed to use a bike for the portage. You must walk. Class 4 and 5 challengers that do not switch boats will get a special designator in the race results. If you are planning to switch boats, you must describe both boats in the boat description section of your registration. For example, beach cat switching to Seda kayak for stage 4. Note the Hobie AIs and TIs may remove all aka, ama, and sail parts instead of switching boats. Then the boat description might say, Hobie AI stripping down for stage 4. Note that you must switch to a Class 1 boat which means you can still have a downwind sail up to 1 square meter per paddler, but this sail must be carried the whole race. A race official MUST be informed and OK the switch BEFORE it can take place. You may have to wait several hours for the official to approve the switch. DO NOT MOVE ANYTHING until the race official is there. Instead of getting mad about any delay that might occur, take the time to rest, eat, and recover. You must paddle upstream from Traders Hill to St. George. You started in Florida but the first checkpoint for this stage is on the Georgia side of the river. Traders Hill is a historical site that has been used by the Indians, the Spanish, the English, and American Colonials. Even Daniel Boone used this site on some of his southern hunting expeditions. Sailors came up this far to get fresh water that was known to stay "fresh" for long periods. Known in the 1700 as Fort Alert, early settlers used the fort as a refuge during the Indian Wars. Its location at the head of navigation on the St. Marys River made it one of the most important trading centers in the Southeast. In 1854 it became the county seat of Charlton County, and maintained that distinction until 1901 when Folkston, flourishing along the old S.F.W. Railroad from Savannah to Jacksonville, became the new county seat. Traders Hill Park has been developed at the site of the old courthouse. It continues today as a popular recreation site with a nice boat ramp and a small campground. There are several miles left to go on the St. Marys before you reach St. George and the take out for the portage to Fargo. Lat/Lon of Traders Hill Landing is 30.782833° and -082.024167°. This is the canoe landing on the St. Marys river at the Traders Hill checkpoint. IMPORTANT: Go past the dock and the cement boat ramp. Go just past a cypress tree/stump. You will find this nice landing. You can't see this until you pass the cypress tree/stump. Fargo is five miles north of the Florida/Georgia line. After you finish your long trek from St. George your access point is on the NW side of the river just off of GA Highway 94. There is a paved launch ramp and a sandy area to camp, but camping NOT allowed right at the ramp or near the park office. Fargo is a small town with a good size convenience store (hours are roughly 6 to 11 most days.) and a couple of country restaurants. It is perhaps 1/2 mile from the canoe landing. Although camping at the landing is not officially allowed, if you arrive late at night and apply a bit of stealth, you can probably take a break. If you walk up to the store for re-supply, be sure to take all valuables with you and leave your boat hidden. Don't be gone too long. It is best to help keep honest people honest. Lat/Lon of Fargo Landing is 30.683° and -82.5595°. One block north of the intersection as you portage through St. George. Call to make a reservation when you are within range and your name will be on the door when you arrive. "I do not recommend that you shoot the rapids with a loaded canoe. Unload and with a Life Preserver try your luck if it looks safe. Shoot the right side of the rapids. Don't use a fiberglass canoe. I found half of one down river from the rapids one day." There is a portage around these rapids. Also, if the water is low you can line your canoe along the left bank. If you decide to run it, you should scout first and watch for trees and roots that can snag your boat or you and create very dangerous situations. What's a riffle? It's a term for ruffled water due to fast current over rocks but no real standing waves. Kind of a warning of what is to come. If the water level is higher, you might not see these riffles. Note this could have changed since it was last scouted a few years ago. White Springs is a great place to resupply and maybe get a nice meal. This is a call in checkpoint. You must call in a report from White Springs. The Suwannee River State Park marks a transition for the river. The upper Suwannee is fairly remote. From here to the mouth there is more boat traffic so be careful. Numerous springs and some great scenery sprinkled between housing development make up for the increased population and boat traffic. You have another 130 miles to the Gulf. The Lat/Lon of Suwannee River State park Boat Ramp Landing is 30.387667° and 23.26° and -83.169000°. Cedar Key is roughly 20 miles south of the mouth of the Suwannee River on Florida's west coast. The finish line will be at the Faraway Inn on the beach at the corner of 3rd and G streets in Cedar Key. There is a gazebo immediately in front of the beach that will have the lockbox. This location is much simpler to find and reach especially during low tide than the old location. This is a very nice motel and you might want to call ahead to get a room once your ETA is known. The Lat/Lon of the Beach at the Cedar Key CP is 29.136° and 83.036°. If you switched boats at Fort Clinch or St. Marys, you must switch back to your original boat at or between this SP and the town of Suwannee. You are almost done with the Toughest Small Boat Race in the World. On to the finish! You made it to the final leg of a very difficult race. I hope you saved just a bit of energy because you'll need it. This is the shortest stage of the race, but it's a sprint --- GO, GO, GO! You might want to consider the tide when deciding what time to start your sprint. This is a very exposed coast so be sure to keep a careful eye for storms and currents. When you get closer to Pinellas County the boat traffic will increase significantly. Be careful. Unless the weather is bad, it might be best to stay outside for as long as possible. The inside route through Pinellas is constricted and very busy. If the weather is bad you might not have a choice, but then the boat traffic will probably be less too. 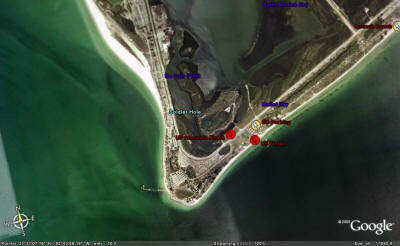 The finish is jsut after the boat ramp at Fort Desoto next to the bridge. An exact lat/lon will be provided soon. The finish location is changing due to changes in park rules. Details will be provided soon.